In autumn, apples, pumpkins and gourds are widely known as “typical” fall foods. Just about everyone is used to seeing pumpkin-flavored this and that in stores. Many like to stay on “safe” by preparing dishes with these “typical” foods. Personally, I like to venture out and try other fruits and vegetables that are in season. Carrots are a classic root vegetable. They are famous for their traditional orange color, but also can be yellow and purple! The vegetable is rich in vitamins A, C, and K. Carrots are loaded with powerful antioxidants that can fight off cancers and many diseases, including heart disease. Liver protection, good eyesight, and brain health are all ensured when carrots enter a daily diet. Carrots can be cut and served raw as a snack with a dip, or can be cooked into soups and stews. Cauliflower belongs to the cruciferous family. It has is similar in looks and texture to its green cousin, broccoli, but you can create a whole different flavor from it! Cauliflower has amazing health benefits. The vegetable can boost your brain and heart health, fight cancer, and provide antioxidants. To cook the cauliflower, put it in a large pot, and bring it to a boil. Then, reduce the heat, and simmer for 5-7 minutes until it is soft. I love to add cheese on top of my cauliflower while it is still warm, so it melts and provides flavor. A lot of kids are into this as well, and it may be a way to make vegetable eating “enjoyable” for your children. Who knows? In 2015, brussel sprouts were voted one of the world's’ least favorite foods. And yet, they are my go-to vegetable. Although notoriously smelly, these “tiny cabbages” are considered a superfood. They can singlehandedly lower your risk of cancer, support heart health, and are rich in vitamins B, C, and K1, potassium,manganese, and fiber. To roast them, simply put them on a baking sheet, drizzle them with olive oil, and season them with salt and pepper. Preheat the oven to 400 degrees, and roast them for 25-40 minutes. Make sure to stir them every 5-6 minutes to avoid excessive browning. There are many more vegetables that are currently in season. They are easy to look up, or simply stop by your local farmer’s market. With such a variety of foods available, keep up the healthy eating habits this fall! 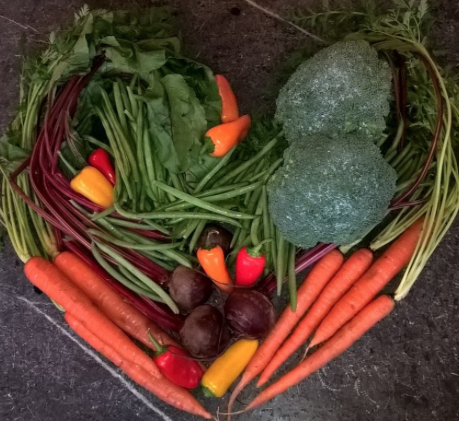 Farmer Foodshare welcomes a new blogger: Marin Lissy loves to cook with her family and friends, and enjoys sharing delicious healthy recipes. She recently won an essay contest sponsored by the Junior League of Durham and Orange Counties to improve access to healthy foods. When she's not balancing sixth grade academic activities, Marin enjoys reading, playing guitar, biking, and spending time outdoors. How many times do your children come home from school demanding a snack? How often do you want to pull out a bag of chips or crackers? This is an obstacle faced by many parents -- putting out healthy after school snacks. There are a couple of solutions to this challenge. Ever have time on the weekend? Sunday nights are a great time to make snacks for the upcoming week. Homemade kale chips, hummus with vegetables, and roasted seasonal vegetables are a few make-ahead’s. Most of these do not even require a recipe--you just have to cut up some vegetables, season them with salt and pepper, and stick them in a 425 degree oven on a cookie sheet for 15 to 20 minutes. It also doesn’t take much effort to google some recipes, even if it isn’t the most creative thing in the world. Even on the first days of fall, it can feel as hot as summertime. How can you quench your children’s thirst? Smoothies! They are a good way to “camouflage” vegetables that you want your children to eat. It may be subversive, but it works! Smoothies can not only be milk/yogurt-based, but may also include leafy greens such as spinach or kale. You can incorporate protein (vegan milks, protein powder, etc), or non-fat ingredients into your smoothies to make them even more healthy and tasty. Never stop experimenting with different fruits or vegetables to change flavors and textures! Looking for a snack with little preparation that could become a favorite of your children? Go for something simple -- peanut butter balls packed with dried fruit and oats, fruit kabobs, or roasted sweet potato fries. Click here for a link to one of my favorites. http://www.thehealthymaven.com/2015/08/no-bake-oatmeal-protein-energy-balls.html. For me, cutting up a raw fruit or vegetable, and arranging it creatively on a plate is a simple strategy to make food appealing. Doing this decreases effort, so you can get to your favorite part--eating it! This has been one of my mother’s tricks, and it still works on me today! Don’t forget about these tips, because at one time or another, they will come in handy. Daddy! Daddy! I've got salad! Mention Farmer Foodshare to Kimmie Champitto, Assistant Director at Johnson Pond Learning Center in Fuquay-Varina, and she breaks into a brilliant smile. 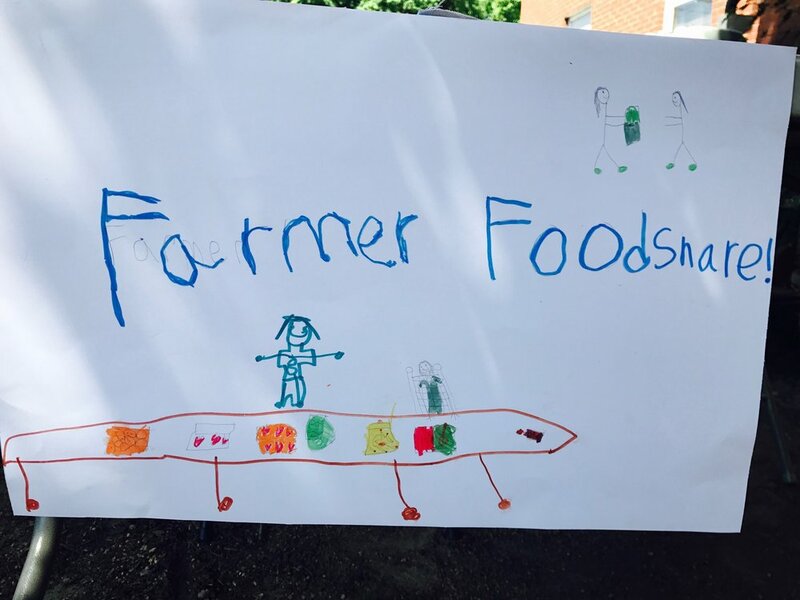 “I was so glad that Wake County Smart Start’s Farm to Child Care connected us to Farmer Foodshare! Such good things have come from that connection!" Along with many other responsibilities, Kimmie is charged with balancing budgets while meeting dietary requirements and still planning menus that kids will not only eat, but also enjoy. She succeeds! Another mom reported that her older child had gone to a different preschool and had grown used to “kid-friendly” foods: pizza, chicken nuggets, fish sticks, and hot dogs. Those became his comfort foods. Her children at Johnson Pond love ‘leaves’ and welcome new fresh veggies, - expecting them to be yummy. She was also very glad that the younger children were so much less ‘picky’ than the older child had become, and were always willing to try new foods. How does Kimmie make this magic? She has been an enthusiastic supporter of Farmer Foodshare’s POP Market (Pennies on the Pound). Farmer Foodshare’s supporters make it possible for Farmer Foodshare to offer Johnson Pond a wholesale market that gives small – mid-scale farmers a fair price, and still keep the markup small enough that fresh, local, healthy produce is a reasonable choice for institutions on budgets. Rachel Kulberg was a former research scientist at home in a lab coat, at home with a microscope, when her beloved father was diagnosed with cancer. Her focus changed entirely. That fine, scientific mind turned to trying to understand how to lengthen his survival. This was personal. Her intense study led her to understand that there is a clear link between diet and cancer which drove her to explore how to grow nutritionally rich food. Today, Rachel is a farmer practicing both aquaponics and soil-based farming using sustainable and organic cultivating methods. She understands that healthy ecosystems eventually lead to healthy communities and healthy people. She also understands economics. Beginning farmers don’t receive the subsidies that factory farms do. Pesticide-free food grown in good soil with clean water is expensive. That means farmers have to make hard choices. Rachel is keenly aware of the importance of local, nutrition-rich food. Rachel wants that for everyone – not just the economically advantaged. She also knows from experience that growing healthy food is expensive, and that farmers have to make a profit to be able to continue. Enter Farmer Foodshare and our POP Market (Pennies on the Pound.) POP Market’s purpose is to help small to mid-scale farmers, beginning farmers, female farmers, and farmers of color flourish. The POP Market offers advice, connections, and a wholesale market where farmers can make a fair profit, and folks in their own area can have access to fresh, local, healthy produce – even people who might not otherwise be able to afford it. Our donors make that possible. Our donors help cover the costs and volunteers help us keep overhead low. That is good for all of us: farmers, eaters, and the environment that supports us. Rachel Kulberg knows- It’s personal. Farmer Foodshare is about people. People like Corly Jones. Corly Jones is a young mother of four with a gentle nature and a caring heart. She is also the Market Manager at the Eno River Farmer’s Market and one of Farmer Foodshare’s best advocates. The Donation Station became a family affair, and as a former teacher, Corly knew the value of learning to care for others at an early age. Her children and their friends and classmates became important members of the Donation Station team. The Eno River Farmer’s Market is also somewhat unique in that rather than selecting one agency to be the recipient of the food gathered, they worked with the public school’s social worker, who selected 10 – 12 families to benefit from the food. Corly also knew that learning how to store and prepare this fresh food was essential. So she morphed Farmer Foodshare’s Food Ambassadors into a Kids’ Cooking Club. Everyone was welcome, and mixed in the group were the children whose families were receiving the donated food. These kids learn how to prepare dishes from a real chef. They taste test the dishes, have fun, and at the end, the children most in need were quietly given the extra food and extra ingredients to take home and share with their families. Corly is our rock, and her kind nature and caring heart ripple out into the community through the children, who are learning the power of being good neighbors. Davon is only 27 years old, but he has learned a lot in his life. Growing up in Pennsylvania, he was a wrestler. He learned about discipline and about competition. Then he enrolled at UNC- Pembroke. His goal – to be a research scientist. He did well in his classes and as he says, “I was a typical college kid. I had fun. I thought about myself – what I wanted to be; what I wanted to have.” Then he made a decision that would change his life forever. He decided to take a break for college and do a tour in the army. He was young, strong, smart, and willing to risk his life for his country. While serving in Afghanistan he did just that. Out on patrol, a bomb exploded under the armored vehicle Davon was in. His life would never be the same. Battling continuing memory issues and bouts of narcolepsy, Davon finished college and set out to find a way to give back. It wasn’t easy, but Davon refused to give up. Then he met the Griffin family. Dr. Neil Griffin had “Fussy Gourmet”, a 500-acre farm that needed a manager. Davon Goodwin needed a chance. It was a match made in heaven. Davon wants his neighbors to have fresh, healthy food, and you know that beginning farmers, like Davon, have to make a living. They also need someone to share advice. Donation Stations at Farmers Markets, where farmers donate fresh food and shoppers donate cash to buy food from the farmers to be shared with neighbors in need. Food Ambassadors, who share demonstrations on easy and economical ways to store and prepare fresh produce. The POP Market (Pennies on the Pound) a wholesale market that connects small to mid-scale farmers with groups or organizations that want healthy, local food, but have limited budgets. There wasn’t a Farmers Market near the farm, but Davon was a perfect candidate for Farmer Foodshare’s POP Market. 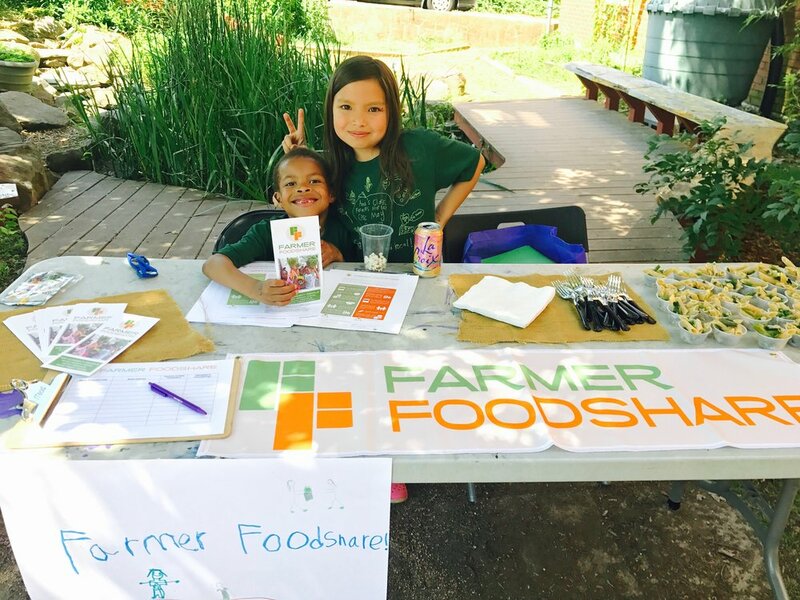 Through the POP Market, Farmer Foodshare shares information about average pricing, packaging, transport, and need, and then serves as the connection between farmers and groups or organizations serving people with limited access to fresh, local food. This is just the population that Davon wants to help, and using POP Market, Davon receives a fair price for his goods. That means he can support his family and continue to grow healthy food for his community. Our POP Market is one of Davon’s favorite customers. It’s another match made in heaven. Hard Work Pays Off! Down 2 Earth Farms is certified ORGANIC! What do an engineer, an International Business attorney and a GIS Specialist have in common? A love for the environment, a willingness to work hard, and wide-ranging intelligence: the perfect combination to found the organically certified Down 2 Earth Farms. Cecilia is the engineer in the group. She brings 20 years experience in the food industry, working as a biological and agricultural engineer. She knew first hand that big farming practices could damage the land. She wanted a farm that fed folks wholesome food and nurtured the land for future generations. “Being organic means more than eliminating harmful chemicals” Cecilia shared. For Cecilia’s farm manager, Matt Ball, those future generations have taken on new importance. He and his wife, Christine, are expecting a son, who will grow up on Down2Earth Farms. Sustainable just became even more important. Matt is the GIS Specialist, that and his experience in land management, conservation and habitat restoration are invaluable. Cecilia’s brother, John Dorsey, is the International Business attorney. He says, “I wasn’t really interested in farming when this started, but I was drawn by Cecilia’s enthusiasm and drive.” Cecilia says that John has been a boon to the business – helping to negotiate the legal aspects, helping with the massive amounts of paper work, and he knows how to influence others. He has headed the marketing efforts for Down 2 Earth Farms – which include navigating the varied needs of multiple markets – like Farmer Foodshare. 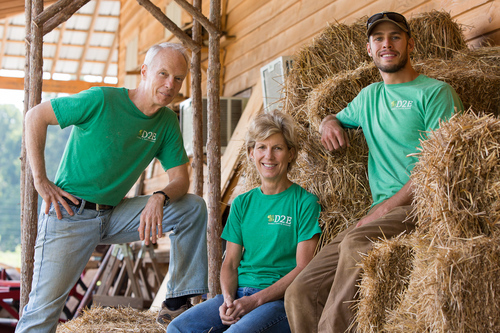 Congratulations to our valued partner, Down 2 Earth Farms on earning the USDA Organic Certification! Want to know what we do? Ask Michelle Morehouse! “We had had a limited amount of fresh produce,” she said. “A dedicated volunteer had a large garden and shared what he could. The food bank had a little, but by the time it got to us, it was often past its prime. Then came Farmer Foodshare and the Donation Station. If you have been to a local farmers market this summer, you have probably seen Eco Farm’s table spilling over with cucumbers, squash, zucchini, shitake mushrooms, flowers, tomatoes, and more. Eco joins the flock of local farmers and artisans that set up at the Carrboro farmers’ market every Wednesday and Saturday all year, rain or shine. We are excited to announce the launch of 2 new Donation Stations this month – Cobblestone Farmers Market in Winston Salem and Caswell Country Store Market in Semora, north of Hillsborough. Located on the southeastern edge of Edgecombe County, Conetoe (pronounced “co-neat-uh”) is a close-knit community home to just fewer than 300 people with no grocery stores. On average, residents in Conetoe, NC bury three of their neighbors every month. In the next year, 10 percent of the community will die of complications from diabetes and chronic illness.